The Open Day held by Slimbridge Dowsing Group (SDG) on Saturday 4th May to celebrate International Dowsing Day was an even greater success than we had dared to hope. SDG members had volunteered their time to meet and greet visitors, and donated cakes and biscuits to sell at ridiculously low prices. We also had photographic displays of some of the work we do, and organised events to test our newly-skilled visitors, including a walk around Slimbridge village hall to find energy lines and underground pipes. 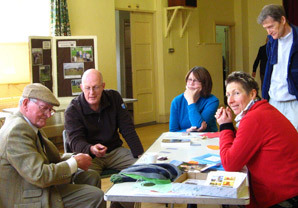 SDG member Jim Greatrix had made a plentiful supply of dowsing rods for visitors to have a go, and local historical shoe-maker Sarah Juniper had collected stones with holes in them, and threaded a length of string through, so that folks could try pendulum dowsing too. Ex-Chairman, now President Peter Golding came despite severe back problems, and demonstrated how dowsing works. One man was so amazed and delighted by what he had learned, he returned later with his son and daughter in tow. Di Holliday offered healing to those in need; one lady left with an enormous smile on her face, relieved of pain for the first time in months. And SDG’s stalwart tea maker and champion washer-up, Ann Jones, was on hand to mastermind the refreshments. All in all a very successful day, with several visitors keen to attend our meetings very soon.